with distinctive all Around Thailand Tours. to fit your requirements whether you are planning for an audacious trekking in Thai jungle or a luxurious beach getaway. The possibilities are boundless. Choose a holiday & vacation package that fit your needs. you can experience what you want, at your leisure and in your own pace. Enjoy a unique experience of authentic Thai culture. 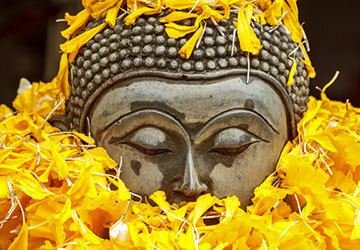 Explore 3 oldest regions of Thailand : central, northern and north eastern. 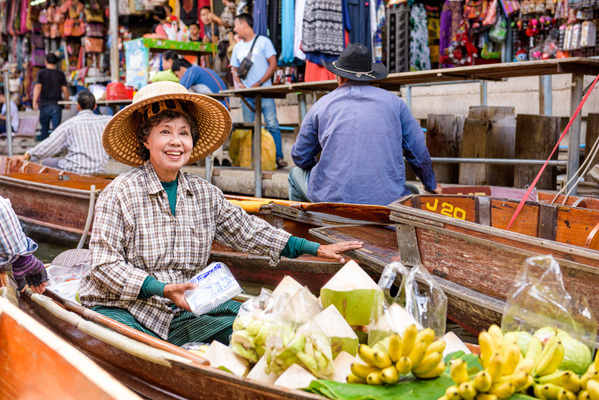 This package takes you from Bangkok to the Golden Triangle and Korat. The dates are flexible depending on your flight. 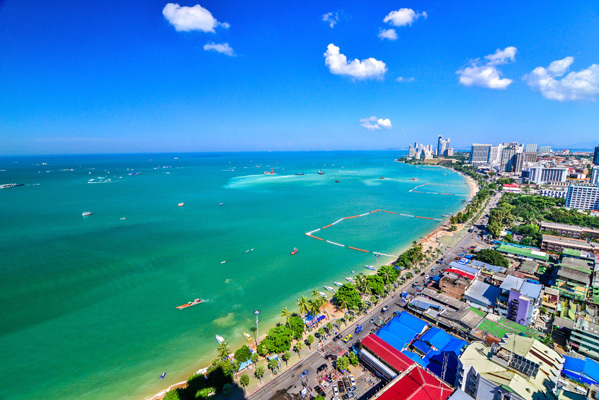 Your arrival date in Bangkok will be day 1 in the itinerary and your departure from Bangkok will be day 13. If you want to prolong your stay, please contact us. Arrival at Bangkok airport. 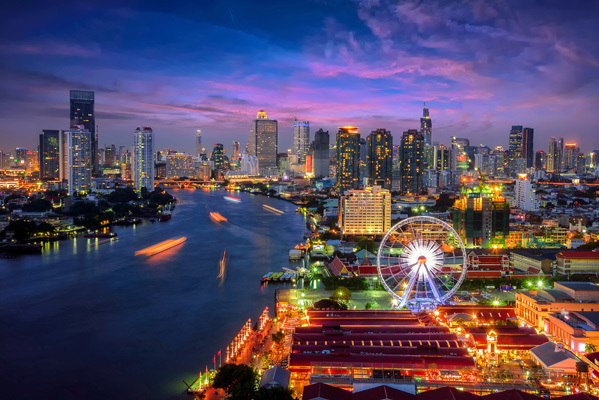 Bangkok is both a province and the capital of the Kingdom of Thailand with approimately 7 million inhabitants intramural. Chao Praya River divides the city into two parts: firstly, the old Bangkok with its old temples and the original palace, neighborhoods. Indian and Chinese, on the other hand, the modern Bangkok housing the business districts and residential and businesses. Bangkok is a modern and dynamic city, overlooked by many skyscrapers but that hides an undeniable identity. Transfer to your hotel. The room will be available from 2pm. First meeting with your tour guide. Visit the floating market of Damnoen Saduak, and explore the canals and boats with multiple activities. Free time for shopping local food and products. Continue to Nakhon Pathom to visit the highest Chedi (127m.) in Thailand called Pathom Chedi in Nakhon Pathom. Back on Bangkok and lunch in town. Visit the famous Bangkok Royal Grand Palace, Wat Phra Kaew (Temple of the Emerald Buddha). Dinner show of Thai classical dancing. Overnight in the hotel (Bangkok). Departure from Bangkok to Ayutthaya , the former capital of the Kingdom of Siam. Visit Ayutthaya historical park (UNESCO world heritage site) : Wat Srisanphet, founded in the fifteenth century was the most beautiful temple of the city. Depart for Lopbui. Lunch at local reataurant in Lopburi. Visit the Monkey Temple (San Phra Kan) in Lopburi province. Dinner and overnight the hotel (Phitsanulok). 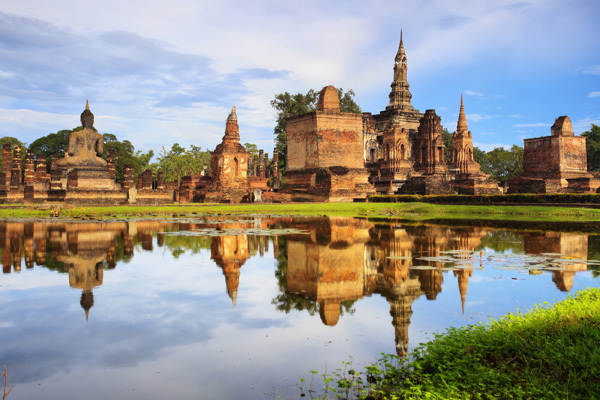 Visit the historical park of Sukhothai world heritage, capital of the first great Thai kingdom in the thirteenth century. Visit temples : Wat Mahathat , Wat Sa Sri , Wat Sri Sawai. Departure to Chiang Rai via Lampang. At Lampang, visit the temple Wat Don Tao Prakeo. Dinner and night in Chiang Rai at the hotel. Departure to visit Akha and Yao tribes: primitive tribes living mainly from agriculture and their crafts. Visit the famous region Golden triangle, thin strip of land bordering the three Thai border Laotian and Burmese. Return to Chiang Rai for lunch and boat ride on the Mae Kok River. Dinner and overnight at the hotel (Chiang Mai). The "Rose of the North" is the second largest city in Thailand, the most culturally significant of northern Thailand and capital of the province of Chiang Mai. She is located 800 kilometers north of Bangkok, among the highest mountains country. The city lies on the banks of the Ping, a major tributary of the Chao River Phraya. The city is an important center for its handcrafted goods, umbrellas, jewelry (Particularly silver) and woodcarving these. Departure for the ascent and visit the beautiful Doi Suthep temple on the hill overlooking the city. The temple is located in a sacred site where you have a view impressive on the Chiang Mai city, 15 kilometers from the city. You reach three hundred and fifty steps framed snakes and giant dragons porcelain. Legend has it that a white elephant carrying relics of the fourteenth century, elected there and died there after barrier 3 times and have been 3 times around. The king Kuena made there soon bury the relic and built a chedi. Continue to visit San Kamphaeng district. Faamous for wooden crafts , lacquerware and jewelry. Dinner traditional food called Khantoke with dances of northern tribes. Overnight at hotel (Chiang Mai). Departure for the elephants training camp and enjoy the training demonstration of elephants. Back to Chiang Mai and afternoon free. Transfer to Chiang Mai Train station and departure by night train (2nd class with air condition). Dinner box and overnight on board. Arrive in Bangkok and transfer to the hotel for breakfast. Departure to Korat via Sara Buri. Visit Wat Phra Phutthabat Ratchawo - ramahawihan, located north of the city, it is one of the most important temples Thailand in particular because of its spiritual centerpiece, a wide footprint of Buddha that sits atop a hill. Continue to Korat to visit the monument of Thao Suranari, erected in 1933 and in the center of Nakhon Ratchasima. This monument honors the Thai heroine known locally as Ya Mo. She who bore the title of Khunying Mo was the wife of the Deputy Governor of Nakhon Ratchasima; in 1826 she became head of the resistance against the invasion of the army of Vientiane. Then visit the door of Chumphon, behind the monument to Thao Suranari, this ancient city gate dating from the 17th century. Visit Wat Phra Narai Temple on Prachak Road, home to a sandstone statue of the Hindu god Vishnu, considered the most sacred object of Nakhon Ratchasima. Departure to visit the Phimai Historical Park, located 60 km north of the city; the ancient sanctuary of Phimai is one of the most beautiful historical sites Khmer Thailand. The main focus is the central shrine girded walls. Depart for Chiang Khan via Chai Ya Phum. Visit of Kaeng Khut Khu, an island in the Mekong particularly picturesque when the river level is low, the month of February to May. Depart for Wat Si Khun Mueang, with a characteristic style chapel North of Thailand and beautiful murals; you will see the temple hall with a Lanna-style roof. Inside the temple room, beautiful paintings that illustrate a fable. Then continuation to the Phrathat If Song Rak, located along the river Man; chedi that was built in 1560 to house the sacred relics of the Buddha. The chedi is distinguished by its architecture Lao style, and was erected in recognition of the friendship between Ayutthaya and the United Lao Vientiane. Departures to Khon Kaen to visit the Phrathat Kham Kaen, sacred place the largest in the northeast of Khon Kaen. Then visit Bueng Kaen Nakhon, the main center of interest and entertainment of the city, Bueng Kaen Nakhon is especially beautiful at sunset and place very nice walk in the evening. Dinner and overnight at hotel (Khon Kaen). Departure for the Temple stupa of Wat Nong Wang Khon Kaen (northeast of the Thailand), built to celebrate the 50th birthday of King Bhumibol Adulyadej and his accession to the throne and the 200th anniversary of Khon Kaen. Doors and windows are richly carved with scenes from the life of Buddha and its previous incarnations. Visit the archaeological site of Ban Prasat, second archaeological site Prehistoric presented as an open-air museum. The excavations, which enabled discovered human bones and pottery, reveal that the site was lived there over 3000 years. Departure to visit Pak Thong Chai, a village of silk weavers. We will see there including stands, but also parades creations of weavers. Continue to Wang Nam Keow to visit the village Farm & Winery. The agricultural area of the village covers 80 hectares of high ground over 500 meters above sea level, this whole area is famous for its natural beauty with cool weather almost throughout the year and the enchanting morning mists. Arrival and Installation at your hotel. Dinner and overnight at the hotel (Bangkok). After payment, our staff will send you a confirmation email within 1 business day. All informations for your trip will be provided. You will be asked to provide us with your flight info. (if you already booked it) so we can arrange the transfers for you.